Valley Oxygen changes its’ name to Synergy Sleep & Respiratory! Valley Oxygen, a leading respiratory therapy company focused on home oxygen, NIV (noninvasive ventilation) and aerosol therapy, is changing its name to reflect its values, business model and expansion into the sleep therapy market. 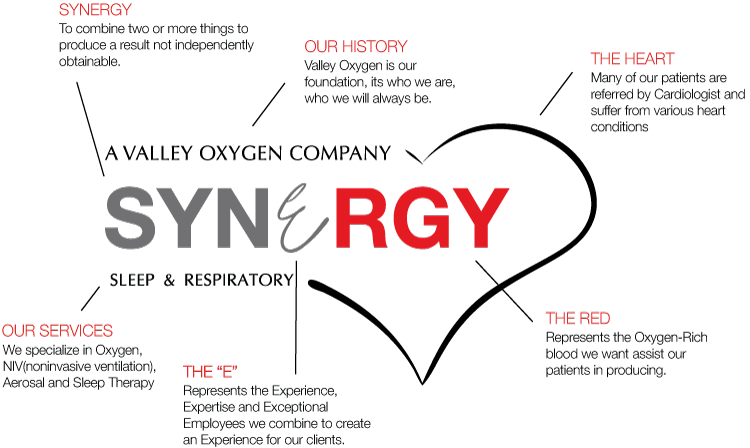 As of June 1st, the company will be renamed Synergy Sleep & Respiratory. "Our new name change is a shedding of the old and moving into the new. We have developed our own identity that will allow us to lead and not follow. We want to set the path for the next generation of DME companies. And “Synergy” allows us to do just that! We are the same company with the same core values, now with a new name that better defines who we are." Synergy itself means two or more things combined together to create a result not independently obtainable. We believe we must combine our expertise with Medicare, with our top-quality equipment to create and experience for our patients and referral sources not obtainable without the two. So when choosing a name fitting of who we are and Synergy encompass just that.